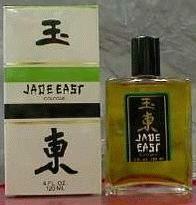 1960s Jade East cologne (by Swank) sported the same ideographs as our restaurant. 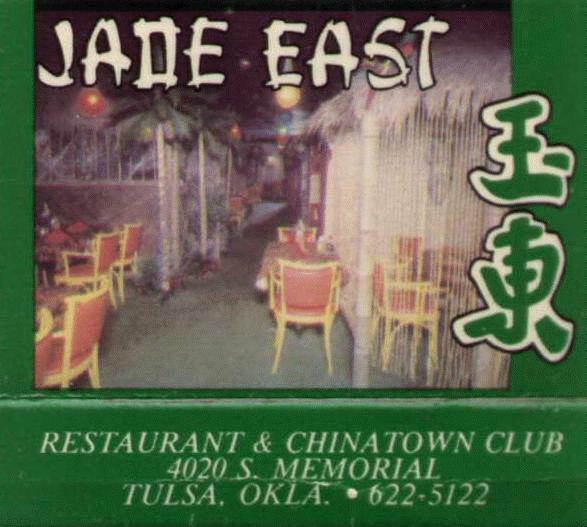 In the early 1990s, I and a group of co-workers made a lunch pilgrimage to the Jade East Restaurant, a remnant of Tiki culture in Tulsa. The Polynesian decor was still there, if a bit down at the mouth. There was a fountain and much rattan in evidence, just as these pictures from the matchbook show. Sadly, I was not then wise in the ways of Tiki, so I didn't pay as close attention as I would now. Just as described by The Book of Tiki (an excellent book), Polynesian/Chinese cuisine is a bit sweet and greasy, and Jade East's offering found little favor at our table. I alone, however, ate all of my buffet meal with gusto. Jade East closed down several years ago. But even today, if I should tout some restaurant's food, one alumnus of this trip always feels called upon to qualify my praise: "Yeah, this is the guy who snarfed up that slop at Jade East". There were no cameras to record my reaction to Jade East's food, but this picture of me is an accurate depiction according to the individual just quoted*. I am not absolutely sure, but I think my old friend and artistic mentor, Saint Clair Homer ("Homma") carved the two Tiki God figures that held up the porte cochere at the "Jade East" restaurant. I helped him carve two twenty foot "Totem Poles" for the old 101 Ranch in about 1960? And I heard that he may have done the Tikis. I ate at Jade East about a year before it closed and was overwhelmed by the cockroaches coming out of the rattan wall covering. WOW! A man's blind date nightmare, or a dog's fire hydrant dream? Neither...it's one of the giant Jade East Tikis! 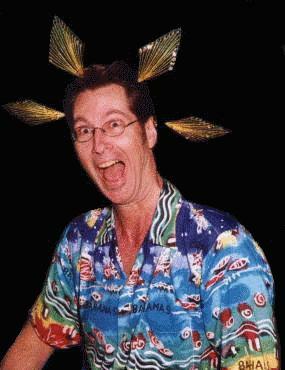 I love your Tulsa Tiki web page. A friend sent the link to me and thought it might interest you to know that I actually purchased the two 10' solid redwood Tiki statues from the old Jade East Restaurant at 41st and Memorial. This is the female pictured with me beside it. Both statues are in my backyard overlooking my koi pond. I was so excited to see who might have carved them, I had no idea about how to find out. Thanks for your information. Thank you for a major art-tiki-logical find, Kevin! He passed away in 1993 (probably the beginning of the decline of the Jade East). He and Jade East won a competition of menu idea exchanges from throughout the world. Jade East was home to the Shanghai Lounge. Matchbook cover from the Jade East. Kathy Hamlin: "The fancy lounges often had bridges that you walked across into the new dimension of paradise." "I grew up in Tulsa and moved away about 12 years ago. Since moving away from Tulsa, I have gotten into Tiki Bars. I have vague memories of a Chinese/Polynesian restaurant at the corner of 41st and Memorial. I think it might have been called "Jade East". When I lived in Tulsa I happened to step inside this place to see if I could find a phone to use and thought it was very unusual. 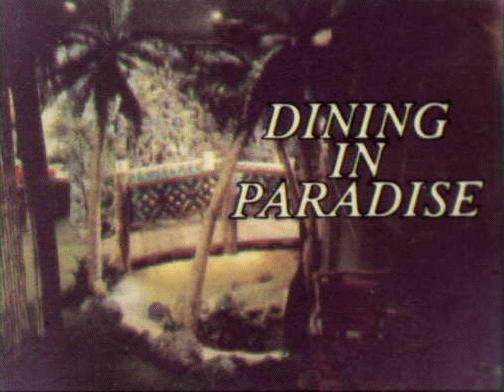 But, not knowing what a Tiki bar or restaurant was at the time I did not appreciate it for what it was. 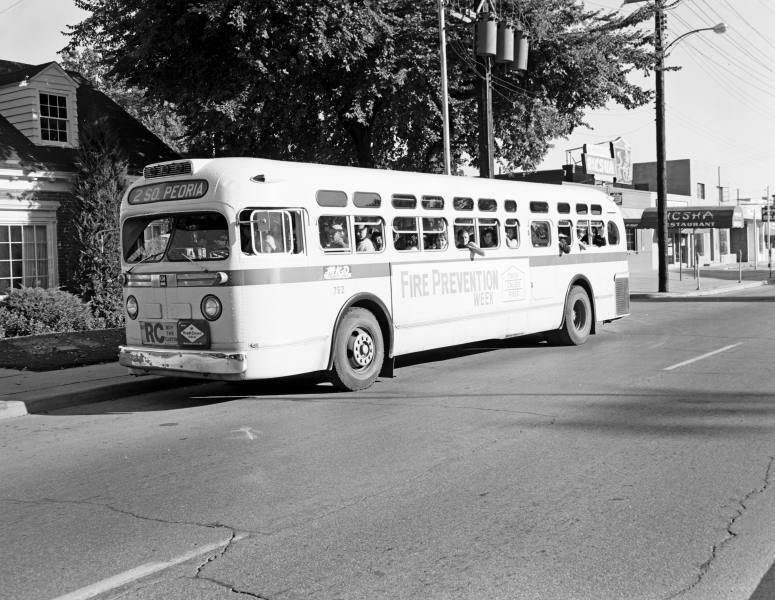 "Years later, I went to Tulsa for a visit and tried to track this place down and found to my great disappointment that it had been torn down and replaced by a Burger King. "Can anyone give me some background on this place? Did they serve Tiki Drinks like Zombies, Blue Hawaiians, Mai Tais? (Well, probably not alcoholic ones, since Oklahoma did not have liquor by the drink when I was growing up there.) If they did serve some type of Tiki Drinks, were they served in fancy mugs? I would be interested in memories, photos, or stuff like matchbooks, mugs, etc... from this place." "I went to the Tulsa Tiki website and was astounded to see that the author of the page wanted to talk to me - Lorrie Akins. I was born and raised in Tulsa, Ok. I lived there until about 1982 when I went off to college in Texas and later to Illinois. I got into Tiki while living in California. 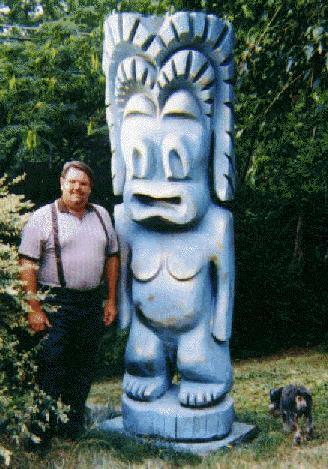 By that time all of the Tiki stuff that I was never aware of while living in Tulsa was all gone. Boo-Hoo!!!!! 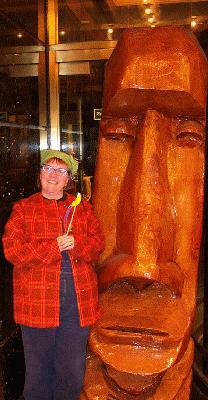 "I am very happy to now live in a town that hasn't destroyed all of its Tiki stuff. I even have a Tiki bar in my basement and run with a crowd of Tiki maniacs who also have Tiki bars in their house. I know the Trade Winds had some fantastic Tiki mugs, but what about the Jade East? 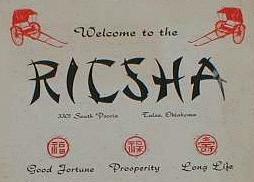 Do you know of any Tiki places left anywhere in the surrounding areas of Tulsa?" The Jade East was not torn down; it has been completely remodeled and is now Tokyo Garden. Bamboo curtains, a rockface waterfall and the bridge over a koi pond are still there. The Tulsa World gave it 3 stars, and we found the food and atmosphere excellent. The Tiki Lounge out east is still in existence, but I don't think it leans too heavily on the Tiki motif at this point. 5/23/2005: The Seven Pleasures Gallery now features photos of the Tokyo Garden. The book Tiki Road Trip used some of the info from the Tulsa Tiki page.